Properties for Sale in the town and district of Eisenstadt and around the Neusiedlersee, Burgenland. Apartments, Houses and Chalets for Sale in Northern Burgenland. Some 63 km south of Vienna (central). 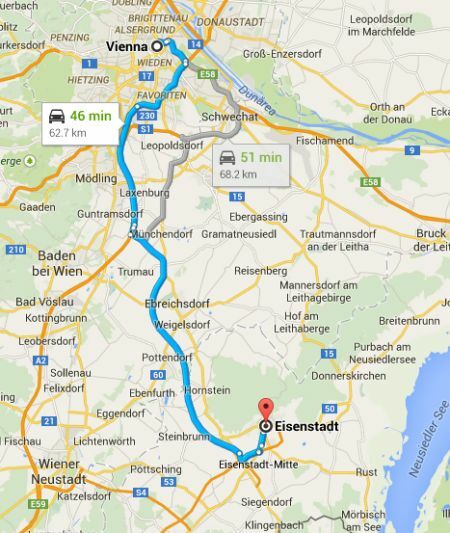 Distance: 62.7 km from Vienna Central. Some 56 km south of Vienna International Airport (Schweracht). Distance: 55.9 km from Vienna Schweracht. Eisenstadt, the state capital of Burgenland, Austria, is a quite small city with some 12.200 inhabitants. It is best known for its most famous former resident, 18th-century musician and composer, Franz Joseph Haydn. Although it doesn’t have a large number of attractions for visitors, it does have a wonderful palace, a couple of good museums and a rather bizarre church. The town is made up of the three cadastral communities Eisenstadt, Kleinhöflein im Burgenland and St.Georgen am Leithagebirge as well as Eisenstadt-Oberberg and Eisenstadt-Unterberg quarters. Kleinhöflein and St. Georgen are well-known for the numerous Heurigen and vintners. Eisenstadt-Unterberg is characterized by the Jewish district and the Austrian Jewish Museum. Eisenstadt’s major attraction is Schloss Esterházy (1364). 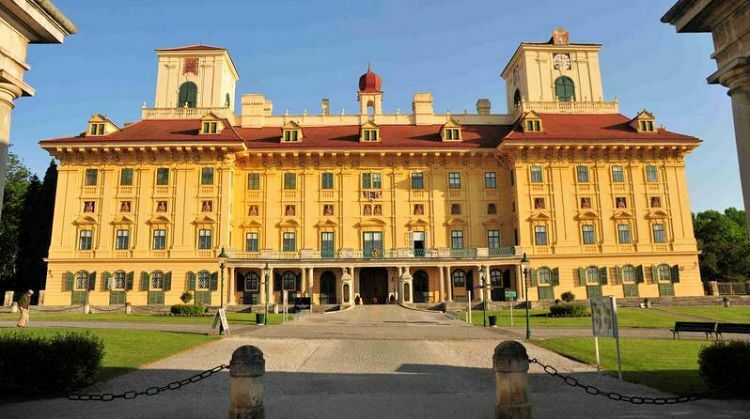 Count Esterhazy restored it initially in Baroque and later in classical style (1663-1672). Today the palace serves as venue for a range of cultural events including the orchestral concerts and operas of the famous Haydn festival. The Haydnsaal Hall is the most important of the representative rooms inside the castle. Joseph Haydn was the court composer of the Esterhazy family and gave many concerts in this room. It is considered to have excellent acoustics and there are still classical concerts organised in these halls. Other parts of the museum are dedicated to the extensive art collection and treasury of the Esterhazys (although the more impressive parts of this collection are on display in Burg Forchtenstein Castle), and other representative halls and rooms. It is also worth checking out the Schlosspark, which was laid out in its current form in the 19th century. 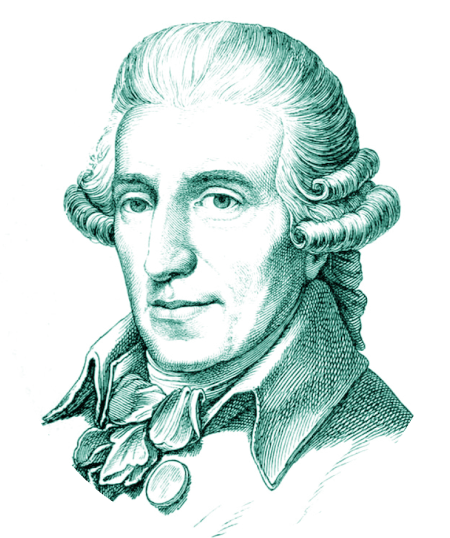 Joseph Haydn left a lasting impression on Eisenstadt where he lived and worked as Prince Esterhazy’s Kapellmeister (music director) for over 40 years. Today Haydn’s white marble tomb can be seen in the Bergkirche (Haydnkirche). Other sights include the Haydn mausoleum and the Haydn House. A Haydn Festival is staged every year from early to mid-September. Lake Neusiedlersee is a lake in the border area between Austria and Hungary. The German name refers to a town of the same name (Neusiedl), the Hungarian name Fertö is more appropriate - it means swamp. The Neusiedlersee is one of Europe′s very few steppe lakes; in terms of surface, the lake is Austria′s biggest. On both shores, the Austrian and Hungarian one, the region is part of a National Park. Lake Neusiedlersee is very shallow - about two meters at its deepest point - and its surface depends a lot on the amount of water that is in it. When the water levels are low, the surface is much smaller; on average, the Neusiedlersee is about 320 square kilometers, of which 240 belong to Austria. The Neusiedlersee is known for its many birds, attracted by the vast amounts of reed. After the river delta of the Danube in Romania, the Neusiedlersee is the largest reed area in Europe. The birds, in turn, attract a great deal of ornithologists and other nature enthusiasts and are the basis for a constant stream of tourists coming to the Northern Burgenland. There are plenty of activities for someone living or visiting the Northern Burgenland: Birdwatching, wine tasting, having a good time in the spas, water sports on the Neusiedlersee or cycling tours in the National Park Neusiedler See . On the eastern shores, bike paths glide through the sun-drenched plains of salt lakes, wetlands and pastures near the Hungarian border, as wild horses, white donkeys, cranes and 300 indigenous bird species fill out the scene. The Seewinkel area is the region east of the lake. 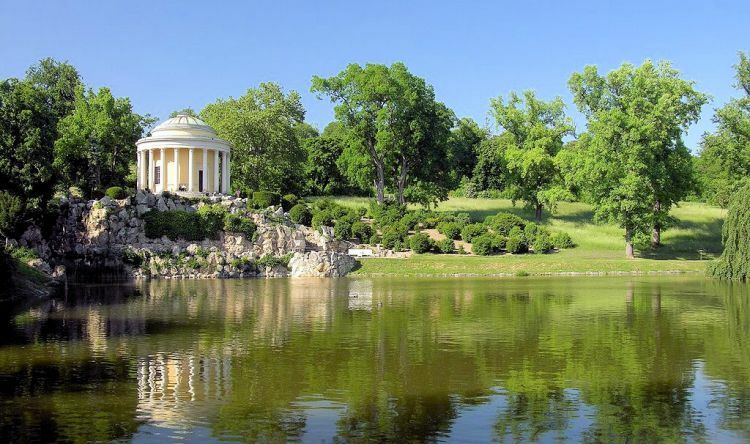 Most people who go there will spend their time cycling, drinking wine and enjoying the soothing spirit of the Burgenland. 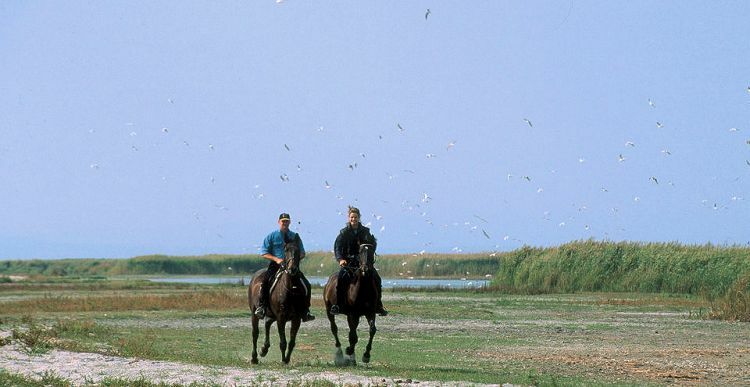 Many people come for bird watching, attracted by some 320 species of birds that make the National Park Neusiedler See a hot-spot for ornithologists of European dimension. The lake's western shores are an easy ferry ride away. The lake's western shore is famous for its vineyards and historic towns as well as its cherry blossoms in spring. The culinary delights of Moerbisch and Rust are worth a mention too – there the most avid bar-hopper will be remodeled into a wine-tavern-visitor. The Neusiedlersee is popular for swimming, especially among Viennese. Due to the shallowness of the lake the water temperature adjusts to the temperature of the surrounding air very quickly -. On very hot days, the water can get up to 30 degrees Celsius. Average temperatures during the summer months is in the 22 to 23 degrees range. Gentle currents in the Neusiedlersee run in a clockwise direction. Climatically, the Neusiedlersee region is ideal for vineyards and tourism: Only 600 millimetres of annual rainfall, the average year sees sun on 300 days. The sheer size of the Neusiedlersee allows the development of strong winds and relatively high waves, ideal conditions for sailing, kite- and windsurfing. The highly diverse soil structure allows for a wide range of vines to thrive. 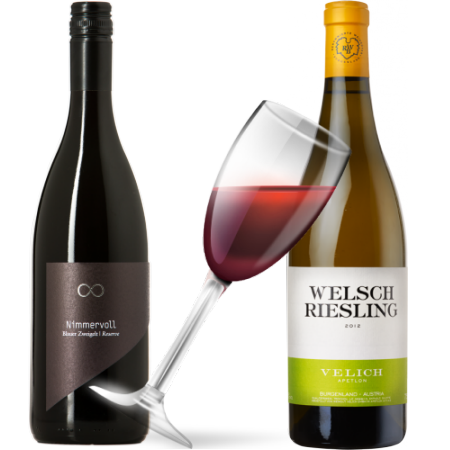 Apart from the leading white Welschriesling varietal, mainly Weißburgunder (Pinot Blanc) and Chardonnay, as well as aromatic varieties, mark the area. Red varietals planted are Blauer Zweigelt, Blaufränkisch, St. Laurent and Blauburgunder (Pinot Noir) as well as newly added international varieties. The local gastronomy also celebrates triumphs, scoring with an exciting combination of creative, modern cuisine and down-to-earth products. Delicacies made from vegetables, fish or beef adorn the menus, and are accompanied by wines to suit every taste. Complementing this culinary program are plenty of opportunities to go hiking, bike-riding, horseback riding and to enjoy water sports. There is strength in calmness. And an active holiday by Lake Neusiedl is just that – strength for the soul. Here you can sit in a boat and cast your fishing line. 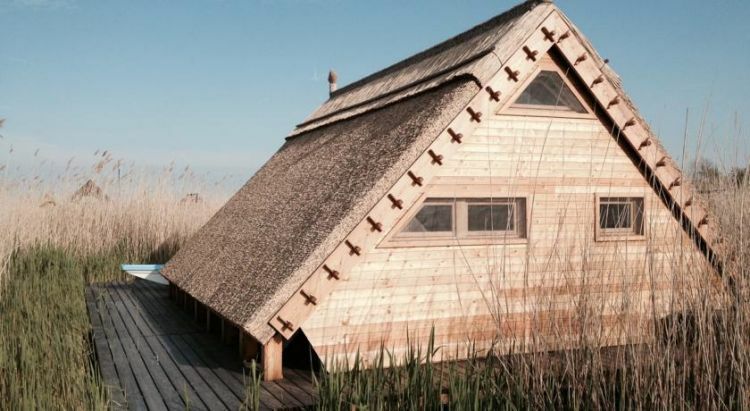 Enjoy views across the water while the reeds gently sway in the wind. You can let your thoughts run free here. 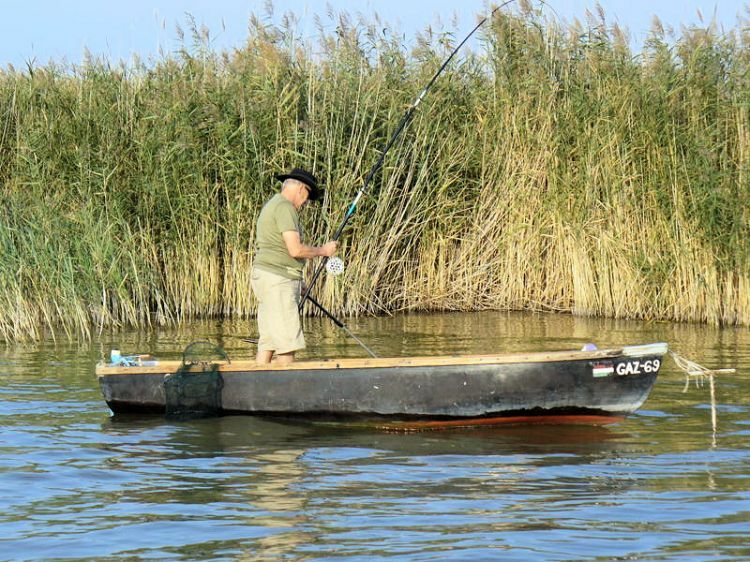 With a water surface of 300 km2, Central Europe’s largest steppe lake offers endless opportunities for fishing. Please note that there are restrictions on how many fish you can take from Lake Neusiedl: you may only remove one predatory fish and three prey fish each day. You can obtain daily, weekly, monthly and annual fishing passes for Lake Neusiedl at the Drescher shipping office in Moerbisch. The region around Moerbisch can be explored by horse riding enthusiasts during enjoyable rides through the magnificent national park. Gallop across the steppe terrain and feel nature take a hold on you. From high up in the saddle, you can see right across the landscape for a whole new perspective. The experience can also be enjoyed as part of a horse-drawn carriage ride. We usually have quite a number of properties for sale in Burgenland and we just cannot list them all. We have building plots, commercial premises, Hotels, Gasthofs and apartment houses, apartments, family houses, wine cellars, weekend houses, renovation properties and so on. There are usually very few properties for sale in this resort. We have none at present but please check back regularly.